The new Fitness Zone in Lloyd Town Park was completed just as the warm sunny weather arrived in Tullamore. It has been in constant use since. Not surprisingly, it is particularly popular with young people. They are agile anyway and are up for the challenge of trying out something new. The Fitness Zone or Outdoor Gym is a Tullamore Lions Club project. Club President, Pat Lalor, said it is a tangible and enduring way for the club to show its appreciation of the generous support it has received from the people of Tullamore and surrounding district since the club was founded forty years ago. It is a convenient and pleasant way to take healthy exercise that is good for the heart and builds physical fitness. Each piece of equipment has an illustration on it showing how to use the equipment to best effect. The good news is that every piece of equipment is easy to use. It is now possible to avail of all the outdoor exercise we are recommended to take in the safe and very pleasant environment of Lloyd Town Park. A circuit of the boundary path of the park measures 0.8 of a kilometer, so even a long five-mile walk can be accomplished by doing ten circuits of the park! 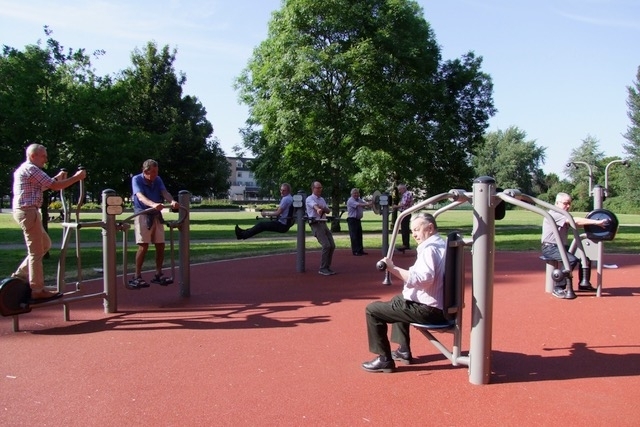 The Lions Club is pleased that young people are setting a good example by using the equipment and are encouraging older people of all ages to think of the recreation and health benefits it offers and then try it out and judge for themselves how they might benefit from using it regularly as a means of maintaining their fitness. There is no cost involved in using the equipment, which is available for use at all times while the park is open to the public. The equipment, which is of the highest standard available, is suitable for use by everyone over the age of thirteen. The budget for the project is €40,000. The Lions Club received a generous grant from Offaly Local Development Company and valuable help with the preparatory and ground works from Offaly County Council who also granted the club a license to use the site of the Fitness Zone. The Fitness Zone will be officially launched on Thursday 12th. July at 5.30pm. It is now a community facility and everyone interested in being there is welcome to attend.